If I popped into your neighborhood unannounced, would you take me out to lunch? With this end-of-year fundraising appeal, I'm not asking for more than that--a single lunch, a week of lunches, or perhaps a month of lunches. Actually, I'm not asking for lunch for myself, but rather for funds that will support worthy causes at ground zero in Palestine, causes I'm involved with, support, and can personally vouch for. It’s that time of the year again when we all get flooded with fundraising requests. I used to dread fundraising, but not anymore. Although the outpouring of moral support is deeply appreciated and needed, ultimately, impact requires financial resources. Over the past two decades in Palestine, one sees how foreign funds are used to advance foreign agendas that sustain military occupation and deepen our dependency on Israel. 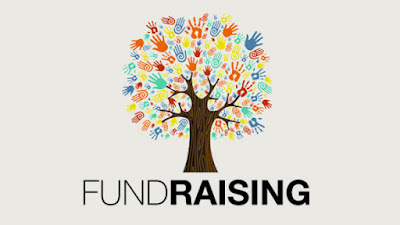 There is nothing to be shy about regarding fundraising for efforts that counter this dependency and do the work that needs to be done to advance Palestinian steadfastness while on the long road to our freedom and independence. Personally, I have structured my life so I can spend 30% of my time in civil society (speaking, writing, engaging with organizations, carrying out campaigns, etc.) In addition to the significant time spent doing all this, I annually donate 10-15% of my income to humanitarian needs, personal cases in need, and civil society activities. This is just the way I was raised. Thus, in hopes that I can lead by example, I present below this year’s list of recommended efforts that are worthy of support. Having some form of a relation with all of those listed, I can attest to their validity. For those opportunities that provide U.S. citizens with tax-deductible status, I have made a note. Thank you in advance for considering. Just CLICK ON THE LOGOS BELOW to go to the respective donate pages. For starters, you may choose to support my own personal efforts, which range from supporting individuals in need, donating to various not-for-profit organizations and others, donating to needy cases (with a big focus on education), as well as providing for the time and travel costs to publicly speak and engage dozens of visiting foreign delegations. This past week, my wife and I joined the packed auditorium at the Palestine Red Crescent Society headquarters in the Al-Am'ari Refugee Camp in Al-Bireh to watch the Palestine premiere of the recently released documentary, Naila and the Uprising, which documents the First Intifada and the role women played in leading it, among other powerful themes. WOW! This film will be showing at a location near you soon and is not to be missed. I'm proud to be a Just Vision board member and can tell you that this outfit is professional, strategic, and has on board an absolutely amazing group of people, both board and staff. As a board member, we each commit to raise a funds for the organization. So I reach out to you to help me reach my target. You can also purchase past productions here. Just Vision is a US tax-deductible entity. Yes, President Trump just made life much more difficult for Palestinians on the ground, but thankfully, Palestinians historically and today, clearly make the distinction between the American people and the U.S. Administration, These days, this distinction is more important than ever. Americans for a Vibrant Palestinian Economy (AVPE) is the Illinois-based not-for-profit that I co-founded (and Chair) with my US partner, Edward Thompson (President). We are focused on “Creating Business Relationships Between Americans & Palestinians,” understanding that without livelihoods Palestinians cannot be steadfast and counter all of the Israeli occupation actions that are pushing people to “voluntarily” leave or turn to violence. AVPE is a US tax-deductible entity. Invest in Palestine's First Policy Lab! See more here. We are very close to our target for this exciting new project and your support will get us there. As an Al-Shabaka board member and policy advisor, I can attest to the strategic impact that Al-Shabaka's knowledge products and networking is having in policy circles. Al-Shabaka, The Palestinian Policy Network, is an independent, non-partisan, and non-profit organization whose mission is to educate and foster public debate on Palestinian human rights and self-determination within the framework of international law. Al-Shabaka, Arabic for "The Network," is a think tank without borders or walls. To support Palestinian voices from all walks of life to be heard, please support our work. Al-Shabaka is a US tax-deductible entity. A great number of my public speaking engagements are spent speaking to Jewish-American delegations brought to Palestine by Encounter. Having spoken to hundreds of their participants and engaging dozens more post their Encounter trip, I'm very proud to be associated with this outfit. It is hard to find an organization that takes its mission as serious as Encounter does. I’ve volunteered with Encounter as one of their many Palestinian speakers for nearly a decade. Their work to educate Jewish American leaders and students, mainly rabbinical students, about the occupation is of utmost importance. Additionally, this team is professional, compassionate, and understands the supreme value of education and listening. They deserve our support, especially if you are from the Jewish community. Encounter is a US tax-deductible entity. Every year I try to add to my list an organization that breaks down all the stereotypes about Palestinians. 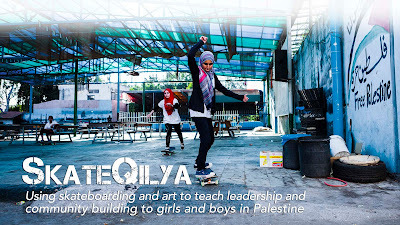 This year it is SkateQilya, a youth empowerment program that uses skateboarding and art as tools to teach community building and leadership skills to Palestinian girls and boys in the West Bank. Knowing many in the powerhouse team behind this project, in particular, Mohammed Othman, Executive Director, and Adam Abel, Development Director, I can see this effort growing to every city and village in Palestine. The SkateQilya Educational Skate Program in Palestine fundraising campaign is almost there, so please pitch in to give these kids the ride of their lives. Thank you in advance for your generous support and, despite the reality on the ground during these difficult days in Jerusalem, Bethlehem, and elsewhere across Palestine, Happy Holidays to all.